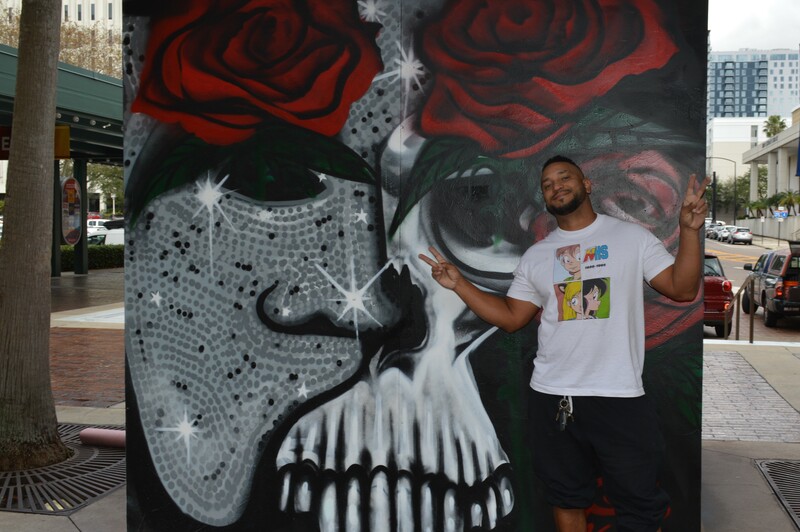 What my friends and I like to do on our down time is have mock photo shoots at random locations throughout Tampa Bay . It gives us, young adults a sense of adventure without breaking the bank. So on a random Thursday afternoon, I dragged my friends out into Downtown Tampa with my camera in hand, ready for any weird model poses with pretty backgrounds. We began walking through The Straz Center to check out some of the new art pieces that were promoting upcoming musicals, which were at the time Phantom of the Opera and School of Rock. It wasn’t until after our mini photo shoot in front of these art pieces that I noticed a man take out cases of spray paint from his car. The matching artist tags that were both on the piece and painted on the side of his car window should have been a hint that he was the artist. Now this is when I introduce Eric Hornsby, a contracted artist for The Straz Center for the last year. 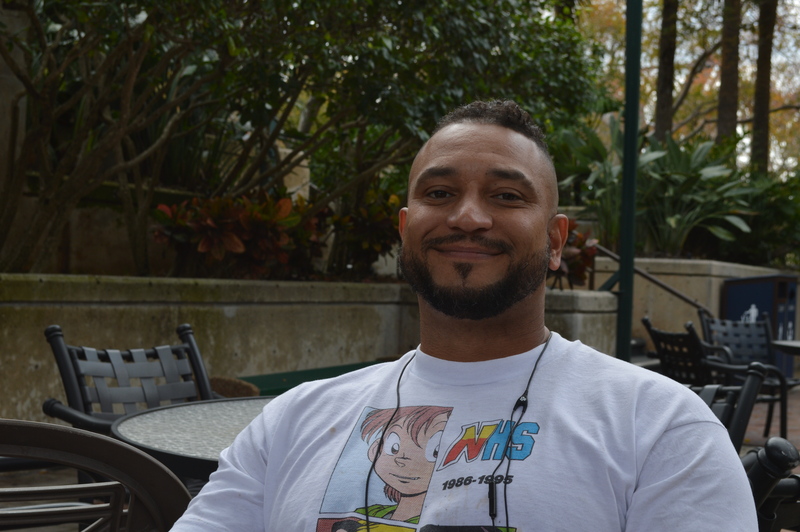 Eric was originally from Rhode Island before moving his way to Tampa in 1984 when he was seven years old. The way that Eric describes his art style was that it was ‘exotic with vivid bright colors that contrast against a black background.’ He told me that most of the time his pieces aren’t often planned unless it was a big project where he’d sketch out an idea first before having some fun with it. Hornsby has pieces scattered throughout our beautiful sunshine state, Atlanta,Georgia and Las Vegas. 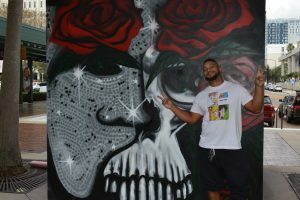 If you want to see any other of his works he had an upcoming project near Tampa Heights on the corner of Franklin or feel free to follow him in Instagram @Artistet. Sabrina Cabrera Rivera is a new columnist for OnTampa. She was originally from Orlando, Florida and is of Puerto Rican descent. She is currently a student at The University of Tampa earning her bachelor's degree as a creative writing major. 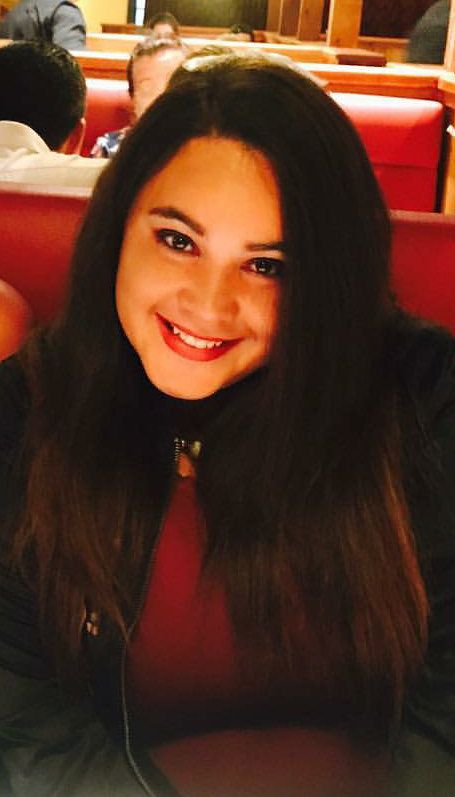 Ms.Cabrera Rivera has published pieces for a online blog called Geekwhale and published a poem at Polk State Community College in 2012 when she was only 14. She also holds a nice skill set of photography experience that she had build in her young adult life. When she isn't studying or writing her life away she uses her free time to take photos of her adventures in Tampa bay, teaching herself Italian, or losing herself in a bookstore. She is always on the move, meeting new people and ready to travel for another adventure. If you wish to contact Sabrina, you could send her a message to her email or Facebook account at hikaroma13@outlook.com.